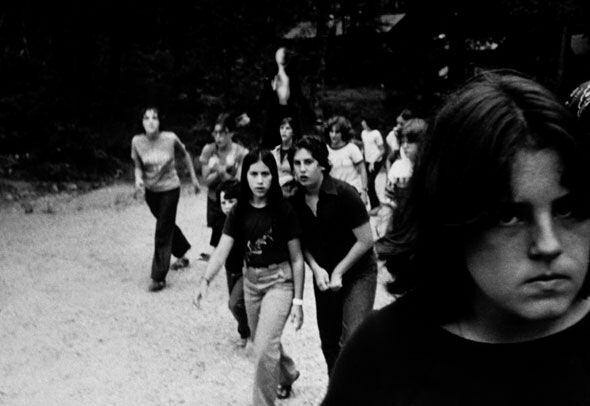 Victor Surge is the original creator of Slender Man, the mythical Internet character who inspired Wisconsin 12-year-olds Morgan Geyser and Anissa Weier to stab their friend in Waukesha woods on Sunday. Surge was the first to make a Photoshopped image of Slender Man, submitting it to a forum called Something Awful (SA) in 2009. From there, Internet users created backstories and more manipulated images of the character, and it grew to become an Internet pop-culture sensation. Here’s what you should know about the man behind the meme. On June 8, 2009, Knudsen submitted this picture to a paranormal Photoshop contest held by the Something Awful (SA) forum. The competition asked people to manipulate ordinary photos into scary paranormal images that could pass as authentic. The creators of these images added background information and captions to make their creations seem more believable. I don’t spent a lot of active time on the Internet since I usually have a lot of real-life stuff going on. A source who identifies himself as a former coworker said on Wednesday morning that Knudsen is “heartbroken over this and deactivated his Facebook account this morning.” The source said that Knudsen feels horrible about what happened, and describes him as a saint and genuinely wonderful person. NBC reported Knudsen’s official statement regarding the stabbings. I am deeply saddened by the tragedy in Wisconsin and my heart goes out to the families of those affected by this terrible act. On June 11, he added another photo and created a longer backstory to accompany his original images. LeechCode5, another SA user, then posted a photo of Knudsen’s Slender Man in front of a burning building that he had edited himself. Two days later, another user, TrenchMaul, used SlenderMan for his own story, and the character has continued to exist in paranormal forums ever since. DeviantArt is an online forum launched in 2000 that allows artists to post self-made images and works of art. Here is Victor Surge’s personal Deviant page. Knudsen’s former coworker says the Slender Man creator is American and from the Chicago area, but was living in Nagasaki at the time he used Deviant Art and created the images. The source said he was with Knudsen the afternoon he created the Slender Man images, and described the afternoon as “boring.” Knudsen is now 33 -years-old and lives with his wife and toddler in Florida. Commercial use of this property is not up use or exploitation by any parties without permission. (See section “copyright” on the Wikipedia entry for Slenderman) Thank you for your understanding! Knudsen’s personal gallery includes the original Slender Man images he submitted to the SA forum in 2009. Knudsen’s former coworker also commented on the original Photoshopped images. I feel the most direct influences were Zack Parsons’s “That Insidious Beast”, the Steven King short story “The Mist”, the SA tale regarding “The Rake”, reports of so-called shadow people, Mothman, and the Mad Gasser of Mattoon. I used these to formulate asomething whose motivations can barely be comprehended and causes general unease and terror in a general population. The creature is also said to stem from Der Großmann, a German folklore about “The Great Man” — a tall boogeyman from the 1500s. Surge has not confirmed that he was inspired by Großmann. Surge is the man behind Slender Man, the mythical horror character and Internet meme cited in a Wisconsin tween stabbing case.